Online shopping is a thriving market. Retail e-commerce sales worldwide are forecast to nearly double between 2016 and 2020. During an April 2017 survey, 40 percent of internet users in the United States stated that they purchased items online at several times per month, and 20 percent said they bought items or services online on a weekly basis. Not only the volume of online sales shows optimistic figures and projections, but also web and mobile-influenced offline sales are forecast to increase in the coming years. Internet-savvy buyers are determined to spend time researching products online and reading online reviews in order to get the best deal possible. At times they do their research online and end up buying offline. 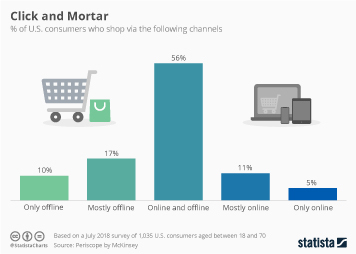 Around 42 percent of U.S. consumers had searched and purchased products or services online, while 14 percent prefer searching online and buying in store. The availability of coupons and discounts is one of the main factors that influence internet users to buy items online rather than go to physical stores. Suggestions from friends and family and ads from a brand could also drive their decision to shop online. Potential buyers may also turn to their social media platforms for reviews, advice, recommendations. These types of feedback on social media can directly influence purchasing decisions. Online discounts and coupons are also popular purchase influence factors, with Groupon and Coupons.com leading the pack. While desktop or laptop computers still remain the preferred digital medium for online purchases in the United States, mobile commerce is on the rise. In the fourth quarter of 2016, mobile e-commerce spending in the U.S. reached about 22.68 billion U.S. dollars, accounting for 20.8 percent of the total digital commerce spending in the country during that quarter. The growth of mobile shopping is not limited to the United States - about 46 percent of internet users in the Asia Pacific region have purchased products or services on mobile devices. Mobile shopping penetration rate in Europe stood at 32 percent in 2016, and almost 30 percent of those in North America had purchased products via a mobile device, whether smartphone or tablet computer. Furthermore, online shoppers use their mobile devices to track a delivery, compare prices among retailers, search for a retail coupon or use a retailer’s app. As mobile commerce continues to grow, retailers are looking for ways to seize this opportunity. Considering some limitations of mobile web browsers, mobile shopping apps are rising as a way to create personalized experiences for mobile customers. As of February 2017, Amazon has the most popular mobile shopping app in the United States, with a 40 percent reach among mobile users in the country. The retailer also leads in number of monthly shopping app users. Many U.S. online shoppers start their shopping journey on Amazon due to the variety of products offered by the retailer and free shipping. Other stated that Amazon has better deals. Other popular mobile retailers’ apps include Walmart, Groupon, eBay, Checkout 51 and shopkick.